I have now completed 6 fasts, and tonight began the 7th day* of Ramadan. For the last couple years, Lilandra has blogged regularly during Ramadan, sharing the family’s meals for Suhr (last meal at dawn before beginning the fast) and Iftar (meal to break the fast) as well as stories of some of the traditions that may or may not be active. This year, I thought I’d share a little of how I approach these important meals, as we are near the end of the first week of Ramadan. Suhr – One benefit of cooking the night before was having a Suhr all ready and waiting – the frittata and lots of water made a great Suhr and this fast was much easier, alhamdulillah. I got work done although I developed a craving for a real cheesy macaroni pie, maybe with beef in it. Iftar – I believe I broke fast at sister-the-elder’s and I cannot recall what exactly I had…hmm…but I had tea eventually! Her oven wasn’t working so NO macaroni pie! Suhr – Uhm…Toast! With…butter. Actual butter because I am out of margarine. And mucho agua. It was Saturday and as per usual I crashed after Fajr so this was an easy fast. Although I DID do laundry! AND I made blackeye peas – blackeye googni (boil and fry peas) because it’s one of the non-fried things that always makes an appearance at communal iftars and I wanted it. Iftar – Of course I had the blackeye peas – Went over to sister-the-elder’s where her oven WAS working and armed with cheese, we made MACARONI PIE. As well as some mini oatmeal-chocolate chip-almond muffins. All with the help of the almost-3 year old and the 4.5 year old, both of whom conspired to wake up the 7 month old so we had him in there too. Suhr – Macaroni Pie of course. And a Kiss goodie. And the water. Suhr – This was yesterday…and I cannot remember…oh…a granola bar I think. And water. Iftar – stayed home and had the blackeye peas. Then made grilled cheese sandwiches on the tawah. With tomatoes, chive and bandania snipped from my herb trough and a mixture of cheeses. Yummy. Suhr– didn’t feel like trekking downstairs, was very groggy. Had a pack of those Go-Ahead biscuits (kept in my room for just such times!) and water. 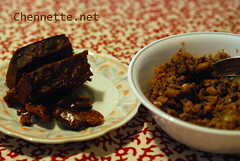 Iftar – as you can see in the photo at the top, blackeye peas (going strong I made a ‘pint’), cake and dates. 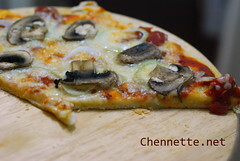 Followed by PIZZA. We made a couple with a biscuit dough like crust (like the one used in my cheese rolls) and 3 from Rose Levy Berenbaum’s recipe. So of course, pizza will be my Suhr! *See previous post on how Ramadan starts. ** My Halal Kitchen has some tips on preparing/planning for meals during Ramadan. This entry was written by Chennette and posted on August 18, 2010 at 12:38 am and filed under Chennette, Eid ul Fitr, Ramadan. Bookmark the permalink. Follow any comments here with the RSS feed for this post. Post a comment or leave a trackback: Trackback URL.